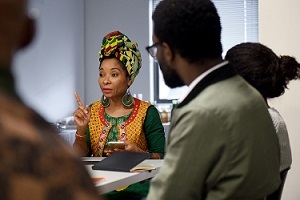 It’s not often that she has the opportunity to speak to black students at UCT, said Professor Mamokgethi Phakeng, so given the chance to mingle with UCT’s Mellon Mays Undergraduate Fellowship (MMUF) cohort on 22 May, she took the opportunity to impart some golden career advice to the aspiring academics. UCT’s Mellon programme seeks explicitly to increase the number of black academics at the university, so the fellows’ seminar with Phakeng, deputy vice-chancellor for research and internationalisation, was just what the doctor ordered. “What has made me the academic that I am today?” the B2-rated mathematician began by way of rhetorical question. “It’s not necessarily something conventional,” she hinted. The “it”, explained Phakeng, was understanding the difference between a job and a career. A career is bigger than a job, she said. “In my mathematical visioning of it, a career and a job must be like two concentric circles, in an ideal situation. A job is a subset of a career. For many, degrees and qualifications are the means to (necessary) material ends, like food, housing, “and shoes”, she quipped. A job would indeed satisfy those vital needs. But a career, embarked on with laser focus from the undergraduate level with a life-long project in mind, could do so much more than satisfy only material needs. Key to this is maintaining one’s identity and keeping focus on the big picture no matter which job title one may hold. Phakeng herself is technically no longer in an academic position – “I’ve been in a management position for the past eight years” – but still sees herself, when it comes down to it, as an academic. This means very long days – work starts at 05:00 every morning – and then more very long days. Does she still need to be writing, supervising students and contributing to conferences regularly? Not according to her current job description as DVC, Phakeng said, but she does it anyway. What does it matter if her DVC duties demand most of her time? There is always more time to be made for her equally important “baggage”, as she termed her academic career and research grants that she maintained during her administrative tenures at Wits University, UNISA and now UCT. Sometimes, especially for young academics, the temptation to abandon the scholarly project and rush into a salaried “9 to 5” is overwhelming. Rest assured that money will come, she told the fellows, though the rewards might be deferred, and even if academic posts didn’t necessarily guarantee them becoming “millionaires”. Another crucial task for young scholars is to find a mentor – something that comes standard with the MMUF programme. Yet just getting a mentor is far from enough. It is up to the student to push the mentor, to arrange regular meetings and to ensure that they are actually being guided and cajoled sufficiently to achieve their goals. The mentor–mentee relationship can continue for as long as both find it useful, and Phakeng described how her own mentor still helps her focus on the big picture for her career. Keeping the big picture in mind also helps when, inevitably, one’s spirit is ground down by the rat race, which can happen even in a “dream job”. With a job, said Phakeng, it’s easier to just jump off the train. “One can say, well, my manager doesn’t do this or that, or my situation is this or that, so I’m going to drop this thing. But if you have a bigger ‘why’, you say, well, I’m not going anywhere yet.